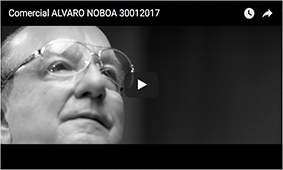 ALVARO NOBOA CONFIRMS RECOGNITION OF THE ADELANTE ECUATORIANO ADELANTE PARTY. 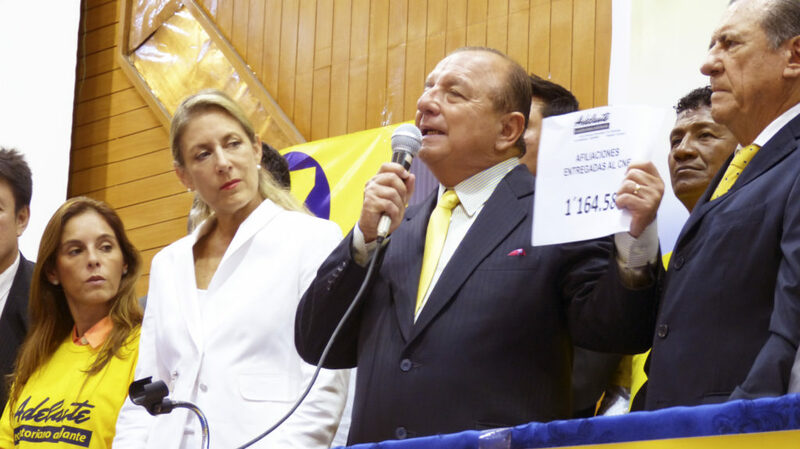 Wednesday August 3 Ecuadorean businessman Alvaro Noboa announced to the Ecuadorean people the official recognition of the Adelante Ecuatoriano Adelante party from the Hall of Democracy, at the National Electoral Council of Guayaquil. Noboa said that until today, according to the report of the CNE (which is attached) the party reached a total of 186,806 affiliations; of which 109,982 (58.87%) of affiliations correspond to main provinces and 76,824 (41.13%) to the total affiliates in small provinces; with these figures, Alvaro Noboa confirmed that Adelante Ecuatoriano Adelante becomes an officially recognized party by the electoral body. “Ecuadoreans, I inform you today, that according to the report of the CNE I have in my hands, we have overcome the required number of affiliations to become a political party, with a 58.87% obtained from main provinces and 41.13% from small provinces, as required by law. We have fulfilled our commitment with all Ecuadorians who demanded our presence in every province. The directors present here today: Dr. Annabella Azin, Mauricio Ponce, Roberto Ponce, Wilson Sanchez Castelo, Wilson Sanchez Zuniga, Sylka Sanchez and the other members of the party, worked throughout the country collecting signatures to meet the aim of the CNE, which is the creation of a national party, therefore, all provinces are represented by the Adelante Ecuatoriano Adelante party. And although we have already complied with the required figure and we have become an official political party, we continue collecting signatures, and so far we have delivered to the CNE of Quito 1’164.588 affiliations, making us one of the two parties with more affiliates in the country and we continue in our task every day, and we continue working every day as it has been my lifelong commitment of serving God, Ecuador, my family, my loved ones and all Ecuadoreans, as if they were my family, because I am at your service until my death. Thank you for this massive support nationwide. There have been a thousand walls put by those eternal politicians to hinder this work, however, we continue building this Homeland, we continue each day generating more jobs, we are the group of companies that generate more jobs in the country, and one of the companies that have raised our flag in the world; because I have served the country as a warrior of God; because I have served the country, as a businessman; because I have served the country, in the world of politics; because I have served the country through my family; I have served God and my country in every possible way, because I love it and always will. Glory to God! Long live Ecuador! Go forward Ecuadoreans Go forward!” Said the party leader. 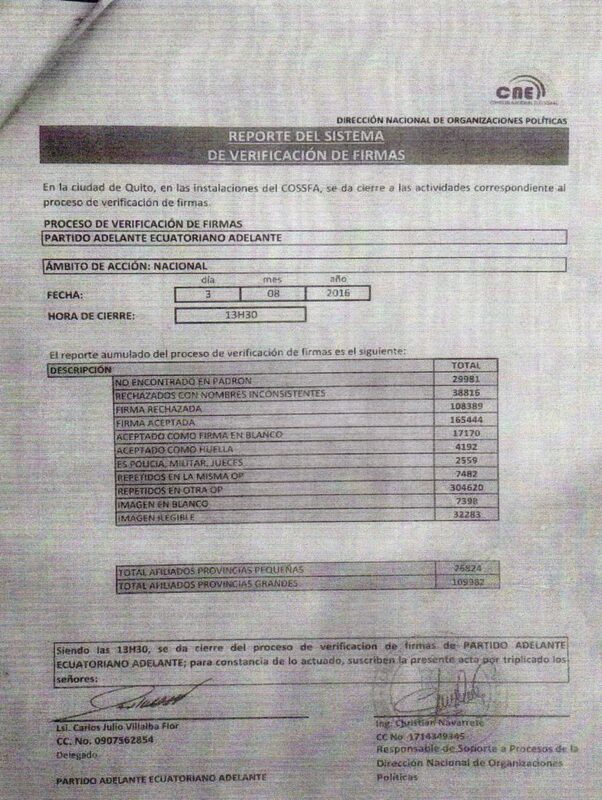 Dear Colleagues, the photo, the audio and the document issued by the CNE is attached.